From the centre of Hazyview town drive north on the R40 towards Bushbuck Ridge. At the last stop street in town (at Perry's Bridge Trading Post) turn left on the R536 towards Sabie. Rain & mist on the Escarpment may hamper the Panorama Route trip. 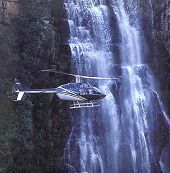 Suggest you check the Graskop & Sabie weather forecast before setting out. Alternative Day Trips to consider for bad weather on the Escarpment would be North, South or East of Hazyview. 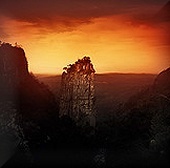 Continue on the R536 westwards until you reach the town of Sabie (45km from Hazyview). 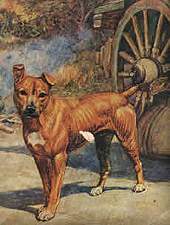 The Forest Industry Museum is in the centre of Sabie town, on the corner of Ford and 10th Street. Drive in the direction of Graskop, turn left at the last 4-way stop in Sabie and follow the old Lydenburg tar road for 2km. Turn right just before the York Timbers Sawmill and follow the gravel (part tar) road across the Sabie river for 3km. Continue along the old Lydenburg Road. 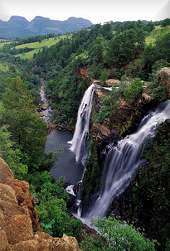 This tarred road ends at Lone Creek Falls, 9km from Sabie town. On the way to Lone Creek Falls you will find the gravel turnoff to Horse Shoe Falls on the left. 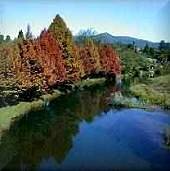 As you exit Sabie town (direction Graskop on the R532) you cross a bridge over the Sabie River. Turn left immediately after the bridge and then left again for the parking lot at the Sabie Falls. Continue along the R532 (direction Graskop). The turnoff to Mac Mac Pools is on the right, 13km from Sabie town. Continue along the R532 (direction Graskop). 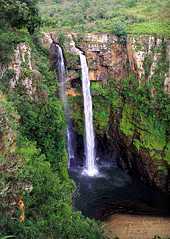 The turnoff to Mac Mac Falls is on the right, 14km from Sabie town. Continue along the R532 (direction Graskop). 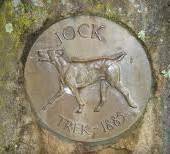 The Jock of the Bushveld Memorial is on the left, 15km from Sabie town. 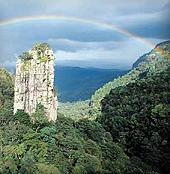 Continue along the R532 (direction Graskop), until you reach a fork in the road (23km from Sabie). Turn left on the R533 towards Pilgrim's Rest. From Pilgrim's Rest you return on the R533 until you reach a fork in the road. Keep to the left. Graskop town is another 5km along this road. From Graskop town you head north on the R532. 3km From Graskop town turn right on the R534. The Pinnacle Rock is another 3km on the right. 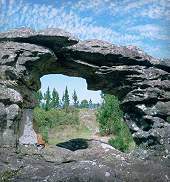 From the Pinnacle Rock you continue northwards on the R534. God's Window is another 8km along this road on the right. From God's Window you continue another 1km northwards on the R534 for the Wonder View turnoff on the right. From Wonder View you continue along the R534 to where it meets the R532. Turn left at the T-junction (direction Graskop). Continue another 1km for the turnoff to Lisbon Falls on the right. From the Berlin Falls you return to the R534 and turn left, heading north towards Ohrigstad. The turnoff to Bourke's Luck is another 26km on the right. From Bourke's Luck Potholes you return to the R534 and turn right, heading north towards Ohrigstad. The turnoff to the Blyde Canyon and Three Rondawels viewpoint is another 8km on the right. The best way back to Hazyview from the Three Rondawels and the Blyde Canyon viewpoints is is to drive south on the R532 to Graskop town and then down Kowyn's Pass on the R535 to Hazyview. 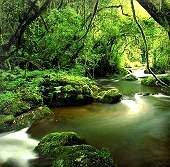 Sabie is a tranquil holiday destination that caters for the whole family - with hiking & back packing, fly fishing, mountain biking, horse riding, white-water rafting, rock climbing & abseiling, bird watching, 4x4 trips, sightseeing, and shopping for African arts, crafts & curious. At the Komatiland Forest Industry Museum in Sabie visitors take a self-guided tour for a unique look into the South African forestry history dating back to the origin of forestry to the present day. 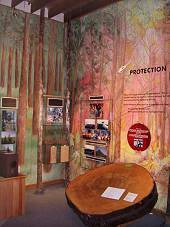 The exhibits explain how modern technology has influenced the development of forestry over the years and the museum serves as an information centre about the forestry industry in a fun and interactive way. 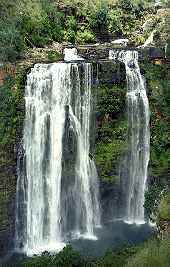 One of the well known landmarks of the area, 9 km from Sabie on the old Lydenburg tarred road. A short (200m) walk through an indigenous forest takes you to the bottom of the falls. 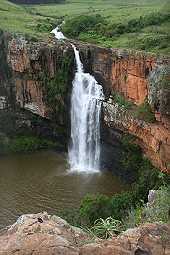 This waterfall is a declared National Monument and is 68 m high. Toilet and picnic facilities available. Easy access for tour busses. The aptly named Horseshoe Falls is in the shape of a horseshoe. Located 6.8 km from Sabie town with the last 3.6 km on a gravel road that can be very dusty when dry and muddy when wet. Situated on the the outskirts of Sabie town, under the new bridge across the Sabie river. 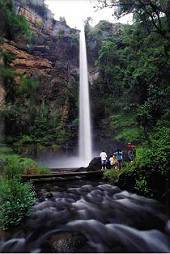 A short walk brings you to a viewpoint where the waterfall plunges 73m down the Sabie gorge. The foundations of an old hydro-electric plant - from where Sabie obtained it's electric power in 1907 - can still be seen at the bottom of the falls. Ample parking space - also for tour busses. Negotiable by wheelchair with some assistance. 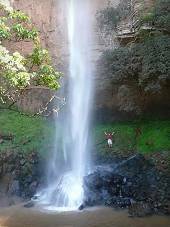 Graskop is a small forestry town perched on the edge of the Drakensberg escarpment. At an altitude of 1,400 m above sea level, it has a temperate climate with a high rainfall and is often misty in the summer months. 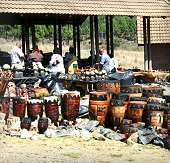 Graskop is a popular tourist destination and is renown for it's pancake bars and curio shops. God's Window - so called for the panoramic view of the Lowveld (and in the distance the Kruger National Park) more than 900 m below - is 9.2 km north of Graskop on the R534 road. From the parking area a steep footpath along the edge of the escarpment leads to the actual view site where there is a Wild Nature Reserve at an altitude of 1 829 meters. Curio stalls and toilet facilities are at the parking area. Choose a clear day to best enjoy the view. 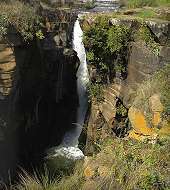 This world renown landmark is 35 km north of Graskop on the R532 road at the confluence of the Blyde and Treur rivers. 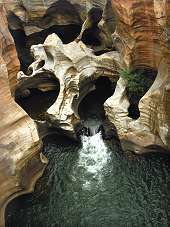 Over millions of years waterborne sand and rock scoured huge cylindrical potholes into the bedrock of the river. The main building houses a Visitor's Centre displaying a model of the Blyde River Canyon, a permanent exhibition of the fauna and flora of the area, as well as the cultural and historical aspects of the Nature Reserve. The offices of Mpumalanga Nature Conservation have a laboratory for biological research and a well equipped herbarium open to the public during office hours. The 700 m walk to the actual potholes start at the main building (wheelchair unfriendly). 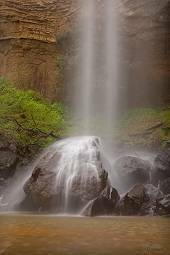 There are also two short circular hiking routes (Bourke's Luck Potholes Interpretive Trail and the Bushman Nature Trail) that start at the main building. 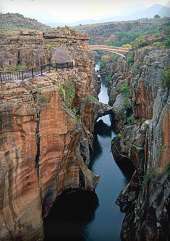 The 25 km long Blyde River Canyon is the third largest canyon in the world and was formed by rivers cutting deep into the escarpment and eroding millions of tons of rock which were carried to the Lowveld and beyond to the Indian Ocean. More than 700 m below the 370 ha Blyde River Dam is visible towards the lower end of the canyon at the confluence of the Blyde and Ohrigstad Rivers. 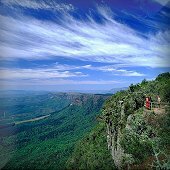 The Blyde River Canyon and the Three Rondawels can be seen from the same viewpoint. There is, therefore, only one entrance fee for both. The three well known gigantic peaks of quartzite and shale with their sheer rock walls tower more than 700 m above the surrounding landscape. These peaks are named after the three most troublesome wives of Chief Maripi Mashile - they are (from left to right) Magabolle, Mogoladikwe and Maseroto. The word "Rondawel" is a South African word that refers to a round hut-like dwelling (usually with a thatched roof).